Whilst a small game takes place at Headingley tonight when Yorkshire take on Lancashire in the NatWest T20 Blast, the main event will commence at Weetwood a few hours earlier when approximately 15,000 less spectators will turn up for the MCC / Red Bull T20 Qualifiers. 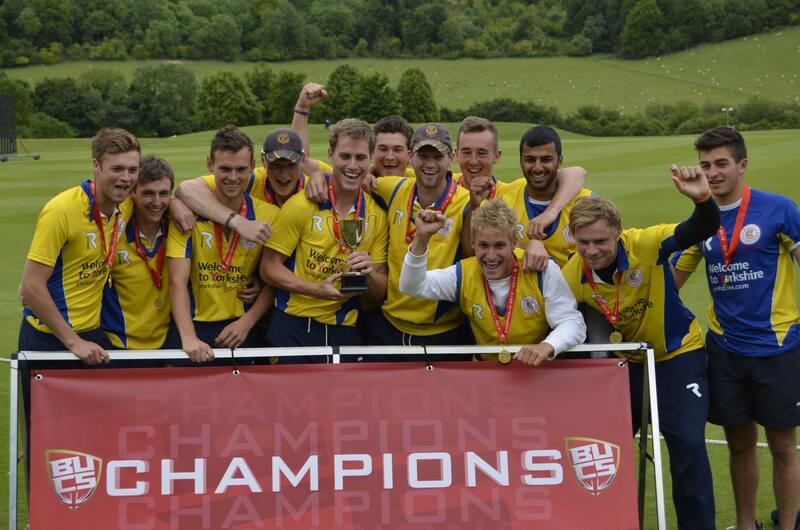 Originally there should have been four teams taking part – Newcastle University, Bristol University, Durham MCCU and the Yellows. We were due to play Newcastle in the first game at 10.00 am but late yesterday afternoon we heard that they would not be taking part – extremely disappointing at such short notice. This means that we have now been given a bye in that game and will now meet the winners of the Bristol v Durham game in the qualifying final. The first game will begin at midday with the final starting at 16.00 hrs. There are three qualifying events taking part – the other two at Loughborough and Cambridge – with the winners of each and the best runner-up going on to compete in two semi-finals and a final at the Parks, Oxford on Monday 15th June. 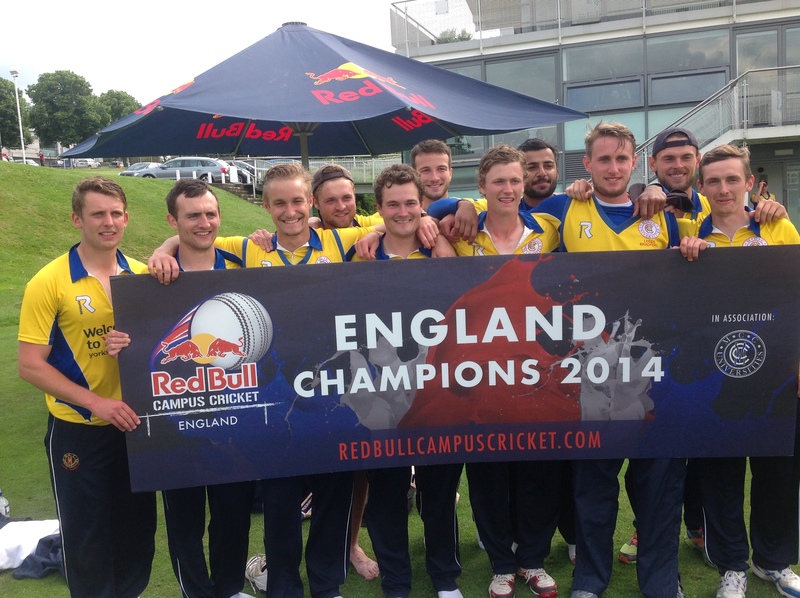 The overall winners will become the England MCC / Red Bull Campus Cricket T20 Champions from 2015 and go on to represent England in the World Campus Cricket Finals in India next October. Having won the competition last year and represented England in the finals at Wormsley & London, the Yellows will be extremely keen to hang on to their title – especially with a trip to the sub-continent in the offing! All support welcome at Weetwood today. It’s free entry and should be the ideal curtain-raiser to tonight’s fireworks down the road!! With one game still remaining in the BUCS One-day competition, the Yellows are almost guaranteed a place in the semi-finals – barring disasters & freak results. A win in their final game away at Durham on 8 June will ensure a home tie (1 v 4, 2 v 3) on Wednesday 17th June. It very much looks as though the other semi-finalists will be Durham, Loughborough and Oxford – although ex-Yellows captain and current Southampton Solent coach Richard Browning will be hoping that his team can still cause an upset and qualify. The final will be played at Kibworth CC in Leicestershire on Wednesday 24th June. Could there be a repeat of 2013 when Luis Reece led the boys to the title? Following our win against Loughborough we go into our 2 week break over the examination period with a healthy lead at the top of the MCCU Challenge 2-day table, but having played a game more than all the other teams apart from Oxford. We’ll all be keeping a close eye on the other games over this period. However, if we beat Durham in our final game next month it should secure us the championship – although an Outright Win for one of our other rivals (where they bowl out the opposition twice) could upset the applecart slightly. Remember, the top two teams meet in the Challenge Final at Lord’s on Tuesday 23rd June. Most cricket pundits will agree that the key to building a decent team total is partnerships – two batsmen helping each other along, rotating the strike, frustrating the bowlers, relying on each others strengths and dominating the innings to add as many runs together as they can for the team. That’s a total of 723 in 7 innings at an average of 144.60! The two batsmen clearly compliment each other – one left handed and short(ish), the other right-handed and tall – but both equally destructive in their own way. Their partnership at Solent was particularly savage when they added 172 from only 111 balls. It’s also clear from the picture to the right that they enjoy each others’ success. Or maybe they just like hugging. And decent form they are most certainly in. So far this season Root has scored 741 runs at an average of 67.36 with 3 fifties and 3 hundreds and his skipper has totalled 429 runs at 47.67 with 3 fifties and 1 hundred. These totals don’t include the friendly against a strong MCC team when Root scored 106* and Davis made 69!! Praise indeed and an indication of the bond that both batsmen are forging both on and off the field. As the Yellows now take a two week break before resuming their season with the T20 Group stages on 5th June, it’s hoped that the two will be able to carry on from where they’ve left off. 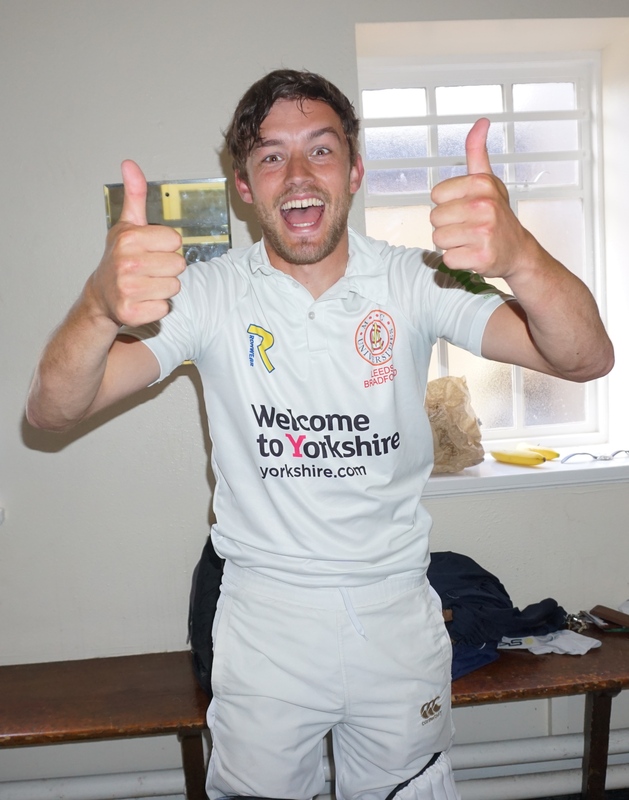 Rooty in particular seems to be keeping his eye in – amassing an unbeaten 218 for Sheffield Collegiate against Doncaster Town in the Yorkshire Premier League last weekend! Over the 15 seasons that Leeds Bradford MCCU has been in existence, wins against Loughborough have been few and far between. We have come close on numerous occasions, often falling just before the finishing line after pressing the self-destruct button, other times being well and truly outplayed, so to record our first-ever victory over these arch-rivals in a 2-day game was particularly sweet. 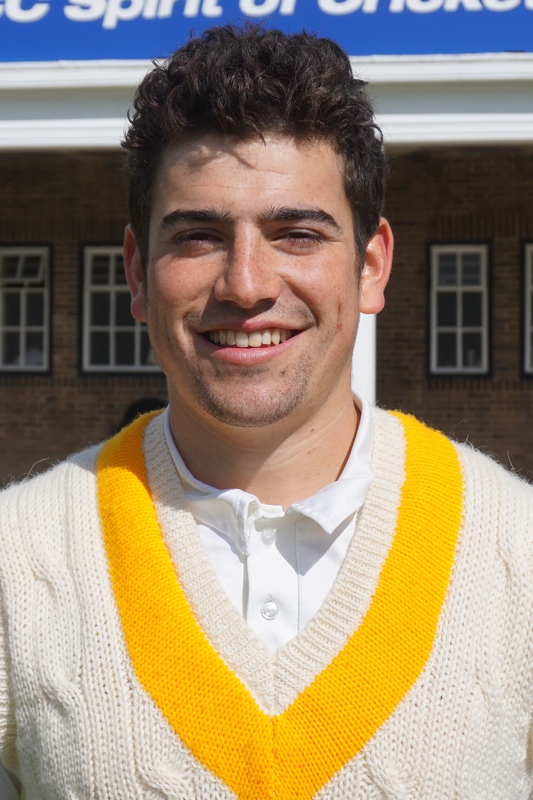 Following a 23-run win in the BUCS game the previous day, the Yellows were without the bowling services of this season’s leading wicket-taker, Alex Lilley, due to a side strain (although he was playing as a batsman) as well as left-arm seamer Archie Ogden. Chris Harwood came into the team for his debut. Loughborough batted first after winning the toss on an extremely windy & cold day! Their innings consisted of a number of ‘steady’ partnerships but only one over 50 – & that was only one run over that mark. Whenever a stand was beginning to look threatening the Yellows bowlers managed to break it, Doug Pratt claiming the first two wickets of Mark Best (scorer of a double-hundred two weeks ago) and captain Anish Patel. At 77 for 2 just before the lunch break and with two international batsmen in Irfan Karim (Kenya) and Nitash Kumar (Canada) at the crease, a 3rd wicket before lunch would seal a productive morning and Liam Watkinson duly obliged. Once again reverting to off-spin as opposed to his usual seam bowling due to an ankle injury, he claimed the scalp of Karim when he trapped him in front just before picking up his knife and fork to make the score at the break 81 for 3. The afternoon session saw the bowlers continue to chip in with wickets to end dangerous-looking stands and at 219 for 7 there were hopes that Loughborough could be dismissed before claiming their 3rd batting point. However, an 8th wicket collaboration of 51 between Akram and McKinley took them to 270. Akram & Gamble added a further 21 for the 9th wicket and when Watkinson took his 4th wicket (4-82 from 23.5 overs) to wrap the innings up in the 85th over, the total was on 296 – so 4 bowling points to Leeds, 3 batting points to Loughborough. Liam Watkinson – valuable 4 wickets. With 19 overs left in the day the Yellows closed on 53 for 1, Henry Thompson being the victim after falling leg before to Toby Lester with the score on 3. 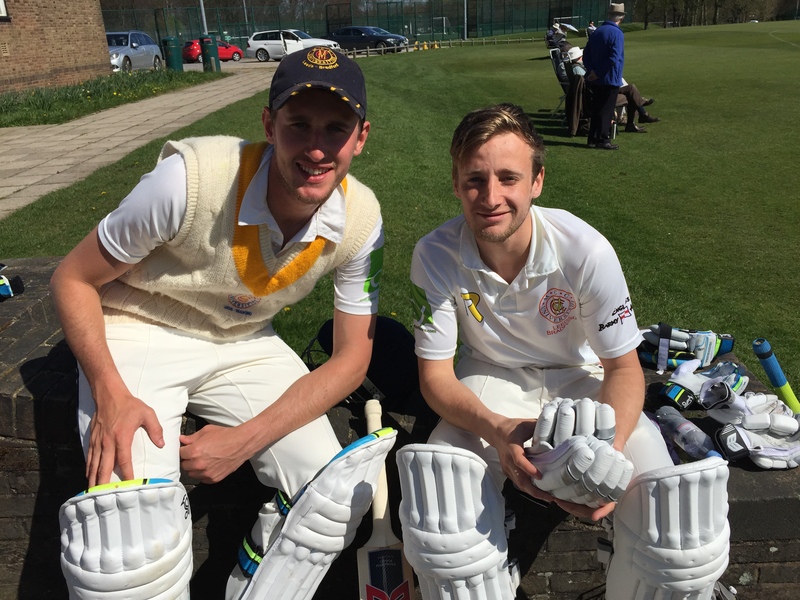 Steve Bullen and Billy Root began confidently on Wednesday in bright sunshine and had added 30 to the overnight score in 8 overs before Bullen was caught behind by Burgess for 31. Christian Davis and Root have forged a prolific partnership this season, having shared 3 century stands before this game. That became 4 as they added 137 for the 3rd wicket – a record for any wicket in 2-day games v Loughborough. At 220 for 2 a first innings win – and first ever 2-day win against these opponents – looked a formality. But we all now how this game can bite you on the posterior. Davis fell to a loose shot after scoring 66, Weston was caught behind, Root was (rightly or wrongly) adjudged leg before having got to 114 – his 3rd ton of the season – and suddenly we were 238 for 5. 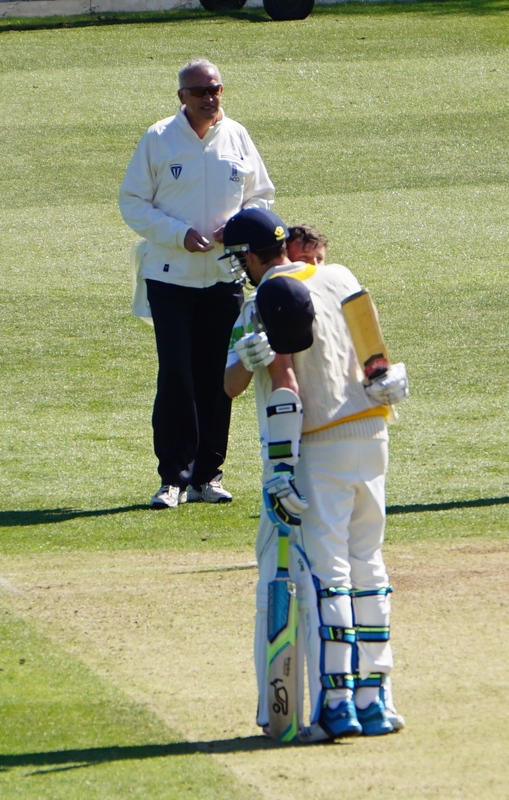 Harry Rouse and George Scott tried to mount a recovery but Rouse became Burgess’s 3rd victim behind the stumps before Scott was run out in a terrible mix-up with Alex Lilley, both batsmen standing shoulder-to-shoulder at the same end. 255 for 7 and still 42 required with the Loughborough tails well & truly up. 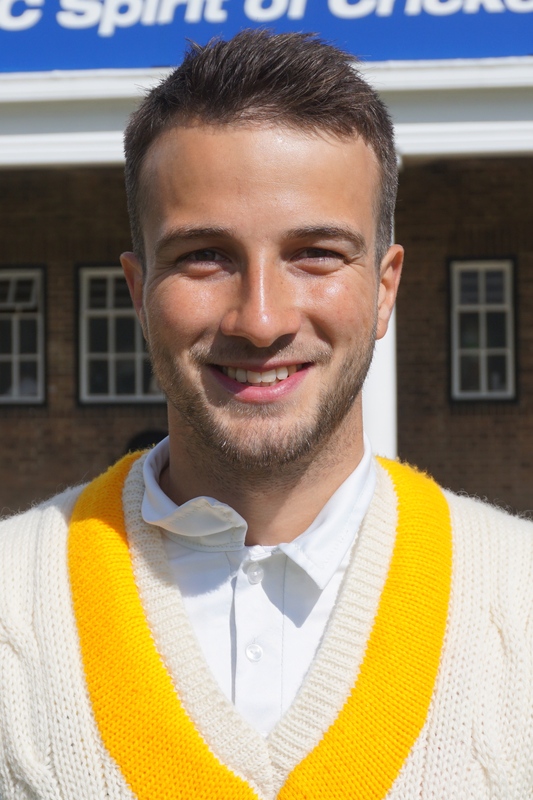 Liam Watkinson was then clean bowled by Stuart Whittigham and when Joe Ellis-Grewal was caught by Le Breton – having been hit on the head, shoulder and arm, the Yellows were still 25 adrift with last man Harwood striding to the crease on debut. Thereby followed one of the more memorable first knocks for the team. In a nail-biting finale, knowing that defeat could hamper any ambitions of a top two finish and a place in the Challenge Final at Lord’s – let alone any hopes of winning the 2-day Championship outright – the powerfully-built right-hander stepped back and cut his first ball for four. A top-edge over the keeper landed safely before further bludgeoning shots hit the Purples like hammer-blows. With the Davis team (captain and manager) unable to move from their spot sitting on the roller and clutching an old bail each for luck, Harwood continued showing complete disdain for the pace attack, striking 4x4s and 1×6 as he took his team to a first innings win and a 4th batting point, the total sitting at 315 when Lilley became the last man out. Lilley’s own contribution can’t be under-estimated. He remained (apparently) unflustered following the run out of Scott and scored an invaluable 23 himself in just over an hour to help see his side home. With 31 overs still left in the day Loughborough went in to bat again in search of extra much-needed bonus points – particularly after hearing they were were being docked 6 points for a slow over rate! A first-ever 2-day win over Loughborough to go with the BUCS win earlier in the week and 18 points from the game. Time for beers on the pitch!! Scorecard can be accessed via the link on our Fixtures/Results page. An indicator as to how good a team is often comes down to its’ strength in depth – the fact that it doesn’t rely on a couple of individuals. So far this season the bulk of our runs have flowed from the bats of Steve Bullen, Bill Root and Christian Davis, so victory against Loughborough when these three only contributed 46 between them was particularly sweet. 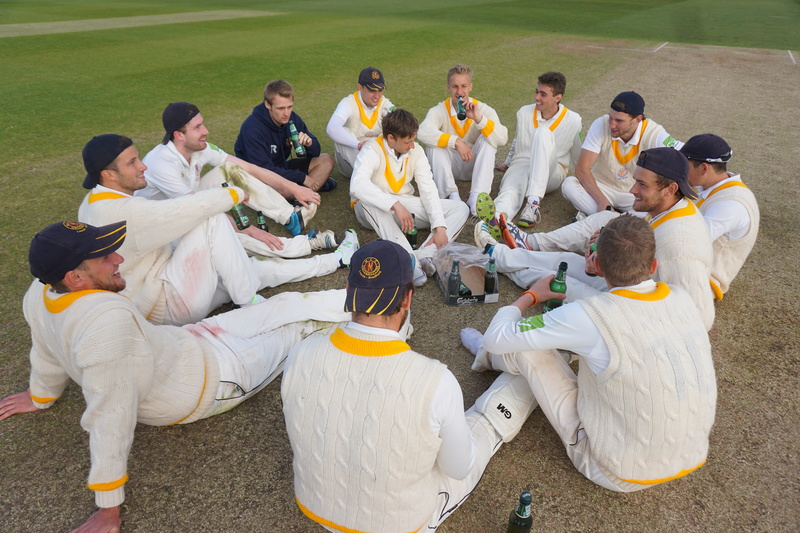 Although ANY victory against Lufbra is ALWAYS sweet. After winning the toss & batting, to be approaching the half-way stage of the innings at 83 for 6 wasn’t ideal following some loose batting and penetrative bowling from Akram & McKinley. With Ryan McKendry playing his first Yellows innings and only 4 wickets left in the tank, it was a case of just giving the bowlers something to bowl at – 150, 160? 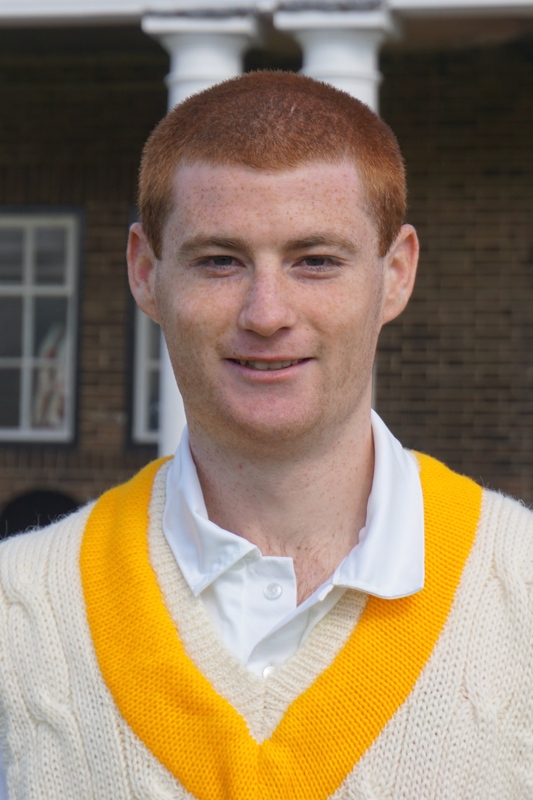 The flame-haired York all-rounder went on to make one the most composed debut knocks in recent memory. After playing & missing at a couple early on he then rarely made an error, stroking the ball into gaps around the field and running superbly with Harry Rouse. The pair had added an invaluable 69 for the 7th wicket in just over 15 overs before Rouse was caught behind off Toby Lester, having scored 31 from 48 balls (2x4s). McKendry remained unflustered, adding a further 64 with Alex Lilley (28 from 34 with 3x4s) and when Joe Ellis-Grewal was run out from the last ball of the innings with the total on 225 he walked off unbeaten having scored 64 from 84 balls (5x4s) in a superb display of intelligent one-day batting. The 2nd half of the innings had produced 142 for 4 – a tremendous turnaround. McKendry was soon to make his mark when Loughborough batted. After Lilley induced a nick to Bullen from Anish Patel off only the 3rd ball of the innings, he pounced 5 balls later to run out Canadian international Nitish Kumar. Karim & Azad led a recovery with a stand of 79, Weston ending it with a sharp return catch. McKendry then claimed his first Yellows wicket by trapping Prowse in front and followed up 4 overs later by bowling Lowen to reduce the visitors to 103 for 5. Azad was still looking comfortable but his downfall came when he tried to sweep Ellis-Grewal and was bowled round his legs for 73. The spin trio of McKendry, Ellis-Grewal & Weston really took a grip on the game and despite a fine knock from Tim Le Breton, a couple of stumpings from Bullen & a ripper to bowl Gamble gave Jegsy his best-ever figures of 4 for 42. 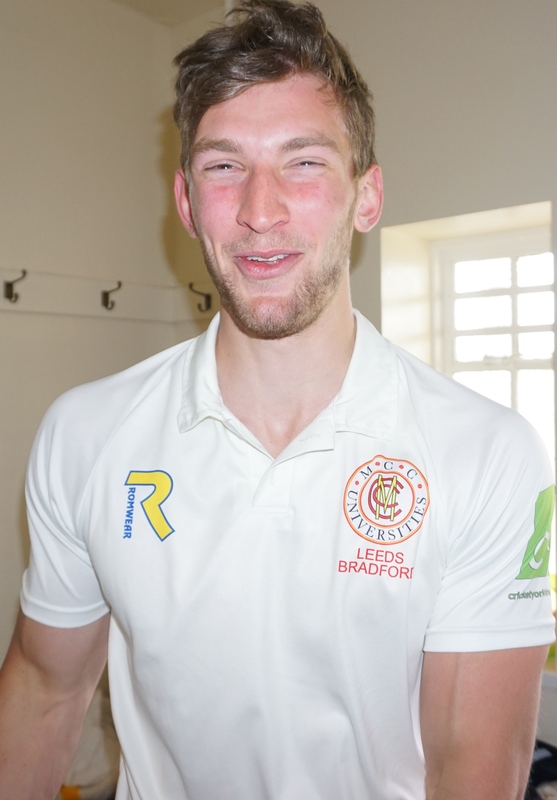 The skipper took a catch at cover to secure victory – as well as giving Rouse his 49th Leeds Bradford wicket. Career best 4 for 42 from Jegsy. A further sign of the team’s strength in depth was the fact that both Alex Lilley & Archie Ogden pulled up injured in the innings and were only able to bowl 6 overs between them. McKendry’s outstanding figures of 10-2-26-2, together with his 64 not out & key run out made the Man of the Match decision an easy one!! Following the abandonment of the BUCS game at Newport and the loss of Day 1 of this game at Usk due to torrential rain, the ground staff at the Monmouthshire club did a wonderful job to enable play on Day 2 – ably assisted by players from both teams. A slightly delayed start (11.30 am) meant there would be 112 overs possible in the day – the team batting first being able to use 55% of that allocation. Christian Davis won the toss for the Yellows and decided to field. Alex Lilley immediately made this decision pay off in the in his second over when Norris was caught behind by Steve Bullen. That, however, was to be the only success for a while, as Scriven & Brand complied a partnership of 166 in 41 overs before Scriven became Lilley’s second victim, Nathan Hill taking a catch on debut to get rid of the opener for 80. Cardiff skipper Jake George was run out for 9 with the total on 184 and the Joe Ellis-Grewal took a return catch to see the back of Tim Rouse – brother of Harry – before Lilley returned to the attack to take his 3rd wicket by bowling Cullen. Jegs was then involved in the running out of Brand, the South African born batsman having scored 117, and Cardiff’s innings finally closed after 61 overs with their total on 267 for 6, leaving the Yellows 51 overs to try and chase down the total. Steve Bullen & Henry Thompson set about this challenge with gusto, taking the total to 95 after 20 overs before Bullen was caught by the keeper, Cullen, two short of what would have been his sixth half-century of the season. Bullen caught Cullen. The ball wasn’t a full ‘un sadly. Thompson was joined by Billy Root & the pair of them continued taking the attack to the Welsh students, Thompson in particular playing his most fluent innings in some time. Unfortunately with the total on 173 the lanky Lancastrian drove the ball to long on, Scriven taking a spectacular catch just inside the rope. He had made 73 from 96 balls (7×4, 1×6). Root was joined by Davis, the duo hoping to continue their prolific run of partnerships, although it wasn’t to be today as the captain became the first of 5 victims for Westphal, the Cardiff opening bowler, after they’d added 28. Still, needing another 67 from 13.4 overs the clever money was still on the Yellows gaining a win. Clever gamblers we are not though! Root fell for 70, trying to steer won to third man but only succeeding in finding the keeper and thereafter Harry Rouse was the only batsman to make any inroads as Weston & Scott were both bowled by Westphal. However, with 6 required from the last over and 4 wickets in hand, the odds were still in our favour! That is until we lost 3 wickets in 5 balls – Rouse being bowled by Westphal for 27, Ogden getting run out after trying to take a suicidal single as the ball passed through to the keeper and then Ellis-Grewal falling to an unbelievable direct hit from Leverock on the cover boundary as he came back for a second. Hill came to the crease on his Leeds Bradford debut needing to score 3 to win from the final ball of the innings to make a heroic start to his career. Sadly it was a swing and a miss, the game ending in a hugely frustrating draw! Cardiff picked up 12 points to our 11 and full credit must go to all at Usk cricket club for getting any play in at all.